There are and have been few like him. It occurred to me as I watched this video, sent by a friend as appropriate for Memorial Day, that General Lee is well worth remembering on that day. General Robert E. Lee died one hundred and thirty-nine years ago on October 12, 1870 (now celebrated as Columbus Day) at the age of 63. We, as a nation, have done with heroes and few remember him. The anniversary of his death will likely go generally unnoticed and unremarked upon. Yet he inspired a nation, or at least a fledgling nation, the Confederate States of America. Those who reminisce about him do so because of his devotion to honor, duty, integrity, for his compassion and for his wisdom. He had those now sadly rare qualities in rare abundance; although I (obviously) never knew him, I miss the likes of him today. When I read a news story dealing with our congresscritters, our president, or His administration, I scratch my balding head and wonder what happened. The anniversary of General Lee’s death having been called to my attention by an article in the Canada Free Press, I read again Rod Cragg’s Robert E. Lee, General, A Commitment to Valor. I could not find a link to the book on Amazon or even on Google, but somehow I had bought a copy at a used book store in rural Panama. This article is largely based on it. This song is about General Lee’s life. Sir, I have the honor to tender my resignation of my command as colonel of the First Regiment of Cavalry. General: Since my interview with you on the 18th instant, I have felt that I ought not longer retain my commission in the army. I therefore tender my resignation, which I request you will recommend for acceptance. It would have been presented at once but for the struggle it has caused me to separate myself from a service to which I have devoted the best years of my life, and all the ability I possessed. During the whole of that time — more than a quarter of a century — I have experienced nothing but kindness from my superiors, and the most cordial friendship from my comrades. To no one, General, have I been as much indebted as to yourself, for uniform kindness and consideration, and it has always been my ardent desire to merit your approbation. I shall carry to the grave the most grateful recollections of your kind consideration, and your name and fame will always be dear to me. When a substantial number of cadets at the U.S. Military Academy left to join the Confederate Army at the outbreak of the war, a special retreat ceremony was held at West Point, and Dixie is said to have been played in their honor. As Lee came riding alone into Richmond [after his surrender], his old followers immediately recognized him and followed him to his home where, with uncovered heads, they saw him to his door. Then they silently dispersed. After four years’ arduous service, marked by unsurpassed courage and fortitude, the Army of Northern Virginia has been compelled to yield to overwhelming numbers and resources. I need not tell the survivors of so many hard fought battles who have remained steadfast to the last, that I have consented to this result from no distrust of them, but feeling that valor and devotion could accomplish nothing that could compensate for the loss which would have attended the continuation of the contest, I have determined to avoid the useless sacrifice of those whose past services have endeared them to their countrymen. You will take with you the satisfaction that proceeds from the consciousness of duty faithfully performed, and I earnestly pray that a merciful God may extend to you His blessing and protection. With an increasing admiration of your constancy and devotion to your country, and a grateful remembrance of your kind and generous consideration of myself, I bid you an affectionate farewell. To compare General Lee with any living person of note would be an exercise in futility. He was a man perhaps unique to his time, no politician, and the world in which General Lee lived was vastly different from the world in which we now live. Any comparison would be as pointless as it would be futile. Still, General Lee’s sense of honor and its necessary adjunct, integrity, stand out as remarkable, and both qualities are sadly missing from many of those who now strut on the world stage. We should perhaps spend a moment to reflect on the character of General Lee in evaluating those who now have become our leaders; I am afraid that nearly all of them would suffer from the comparison. I agree with your assessment of Lee. Last Christmas, I watched parts of Band of Brothers (WWII miniseries) with some friends, including the part where the German officer offers his sidearm to the Allied commander in surrendering. The Allied commander told him to keep it. Afterward, one of my friends asked me if I thought we would ever again face an “honorable enemy” in the sense of that scene between the German and the American officer. I told him no, and he agreed. The statement made neither of us happy. Thanks, Dan. I share your high regard for Robert E. Lee. There are no more honorable or admirable people than those who serve others in harm’s way — soldiers, sailors, airmen, Marines, Coast Guardsmen, law enforcement officers, firefighters, and others who perform their duties for little reward and at the risk of their lives. It’s not at all uncommon for adversaries to respect those across the line, for who else can so completely understand the experience of soldiers in combat than those who share the experience? This happened routinely during the Civil War, as you point out, because they all knew that those they were set against were also Americans, in some cases close relatives. The war was a tragedy for the country in many respects, but the honor and valor of the combatants was nonetheless remarkable. 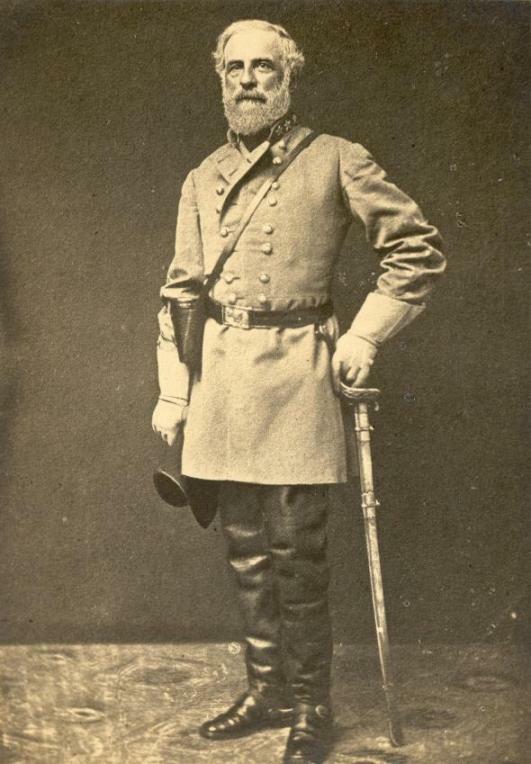 Some may not know this, but in photos Lee can be seen wearing the three stars of a Confederate States Army colonel, not a general, and he rarely wore any other rank insignia. In the CSA, the insignia of rank of general was three stars inside a wreath. There’s always been speculation as to why he did this — his inherent modesty, his recognition that colonel was the highest rank he earned from a legitimate government, his desire to wait until the Confederacy won the war and could legitimately confer higher rank, his recognition that three stars was the insignia of rank of a lieutenant general in the U.S. Army…. I’ve always thought modesty and honoring his previous rank were the reasons. In the same vein, U.S. Grant usually wore a simple private’s jacket, with three-star shoulder straps sewn on. I suppose the greatest men require the least display of importance. Brianna and Tom — many thanks. As a short term chairborne “REMF” JAG Corps officer for four years in the late 1960s, I had neither the privilege nor the burden of leading troops in combat; I never heard a shot fired in anger and don’t have any idea how I would have responded. I greatly admire those who had both the privilege and burden and discharged them honorably. Tom’s account reminded me of this. We can certainly hope that it will never be necessary to find out whether there are any honorable enemies left. I too am worried that there may not be many. Some have had to place their duty to their God, their honor and their country over that to those in charge. Admiral Canaris, Germany’s chief intelligence officer during WWII, found it necessary to do so, secretly, for many years, as did many others. Admiral Canaris was a “traitor,” but not to his country, to his God or to his honor Some survived, some met their fate. In the closing days of World War II, in the gray morning hours of April 9, 1945, gallows were erected hastily in the courtyard. Wilhelm Canaris, Dietrich Bonhoeffer, Major General Hans Oster, Judge Advocate General Carl Sack, Captain Ludwig Gehre – all were ordered to remove their clothing and were led down the steps under the trees to the secluded place of execution before hooting SS guards. Naked under the scaffold, they knelt for the last time to pray – they were hanged, their corpses left to rot.